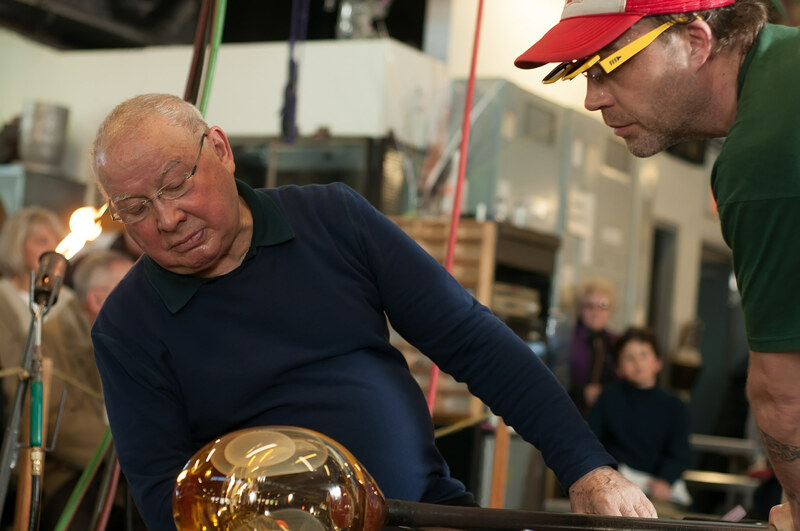 Over the years, Pittsburgh Glass Center has facilitated over 114 residencies. These residencies have involved artists from all over the world, working in all of the different state-of-the-art studios PGC has to offer, and have ranged from just two weeks to six months in duration. View images from our past residencies. Check out a selection of our previous residencies below. Kathleen Mulcahy, PGC co-founder, asked these artists to “think” their ideas in glass over the period of a year. With the assistance of experienced PGC staff, the artists were able to realize their concepts in the new medium and test the range of possibilities in glass. The completed works were displayed in an exhibition in PGC's Hodge Gallery from November 1, 2002 through January 3, 2003. 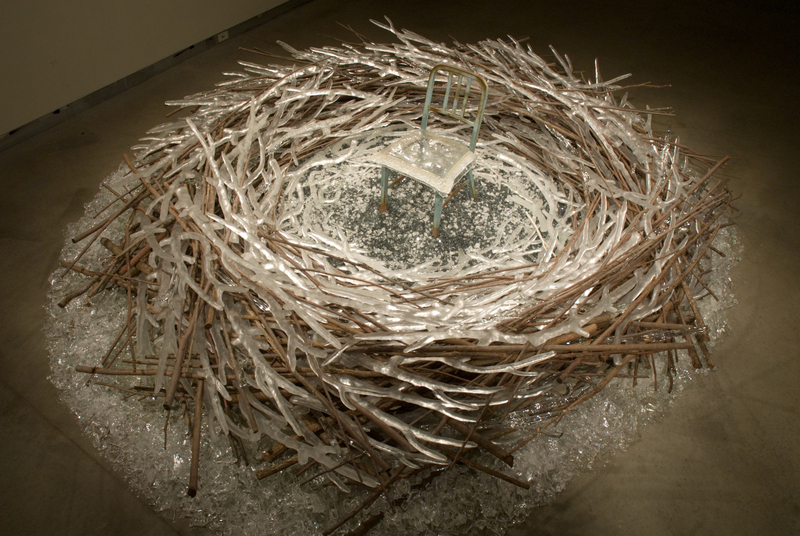 Susan Taylor Glasgow built a giant glass bird’s nest at PGC as a part of her exhibition at PGC, “Absence Of Body.” The exhibition opened Friday, October 3, 2008 and ran through January 9, 2009. Glasgow participated in an eight-week residency at PGC leading up to this premiere exhibition. “The Communal Nest” was the focal point of Glasgow’s exhibition and residency. The eight foot bird’s nest was made up of several hundred glass twigs created by Glasgow and artists from around the world. The center of the nest held an empty chair indicating that someone had just left. “The idea of ‘The Communal Nest’ came from an existing series of my work involving the concept of the ‘Bluebird of Happiness.’ In that series, I combined images of bluebirds and housewives and played homage to the feminine nesting instinct. I wanted to explore that thought further and set that bird free with an installation representing growth and shelter,” said Glasgow. It was important for Glasgow that “The Communal Nest” was built not only by her, but also by the community surrounding it. Artists from around the world were asked to contribute glass twigs to the nest and to include a favorite quote to be transferred onto vellum strips that were woven into the nest. Non-artists could sponsor an artist from PGC to create a twig in their name. The exhibition benefited Pittsburgh Glass Center and Bethlehem Haven, a women’s shelter located in Pittsburgh, PA. After its debut in Pittsburgh, the exhibition traveled across the U.S. making stops at Third Degree Glass Studio in St. Louis, MO where it benefited a women’s shelter and the Bingham Gallery in Columbia, MO in August 2009. This exhibition was supported by the Art Alliance for Contemporary Glass, Bullseye Glass, Huebert Builders and several generous artists and individuals. 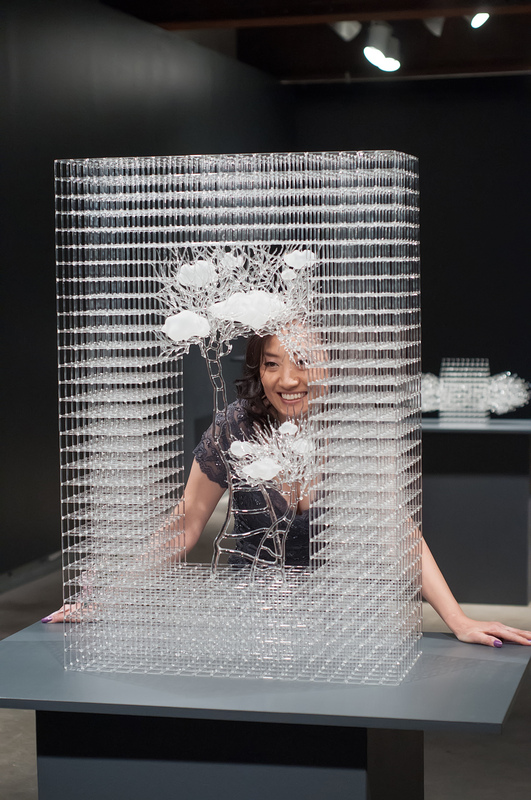 Korean-born glass artist Eunsuh Choi was in residence at PGC in 2012 creating new work for her exhibition in the Hodge Gallery called “Consciousness.” Choi is a portrait artist, whose flameworked pieces are personal narratives, portraits of her own moments of growth. Eunsuh uses flameworking techniques to create objects and installations composed of intricately fused glass threads. Sitting in diligent concentration behind a small torch, she bends and joins thin glass rods into complex arrangements and systematic structures evoking the textiles she studied in Korea. “To make life size objects, I use a flameworking techniques which allow me to think about what it means to aspire-where I’ve been and where I project to be in a meditative process of flameworking. Flameworking also give me a sense of achievement and a chance to think about the objective I had for the piece through the time period in which it took me to work. I’m interested in portraying the human aspiration in life with organic forms from the new perspective I had about myself within a foreign country. Originally from Korea, I relocated to the United States and my Korean heritage tends to make me ask about myself in terms of my direction as an artist and an individual especially after I came to the USA. My work specifically focuses on communicating the graceful flow of our emotional tendencies through the plastic medium of flame worked glass. I like to work sculpturally, utilizing form and its surrounding atmosphere to portray narratives based on the human encounter with success and failure in the pursuit of personal ambition, " said Eunsuh Choi. 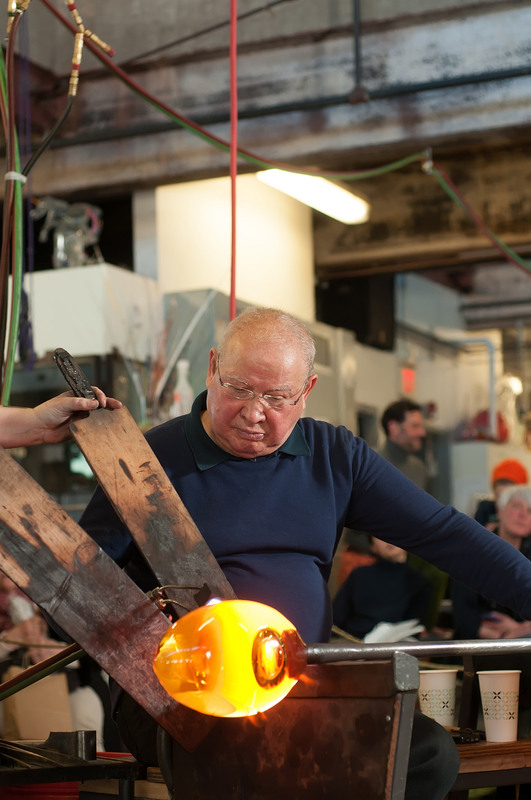 Pittsburgh Glass Center was honored to welcome Lino Tagliapietra, widely regarded as the best glassblower in the world, to our studios for the very first time. He has had a lasting impact on American studio glassblowing and is responsible for sharing techniques and processes from his native Murano with early studio glass artists here in the U.S.
LINO TAGLIAPIETRA is an influential Italian glass artist and master glassmaker who is recognized for his skills and talents throughout the world. Born on the island of Murano, neighboring Venice in the Venetian Lagoon, the artist started from a very young age working at the island’s glass furnaces and factories. Lino was soon regarded as a Maestro (master glass blower) in his early 20’s and granted with that title in the 1950’s, at a time when he worked for some of the most prestigious glassworks companies in Murano. During the 1960’s Lino started expressing his own forms of creativity through the design and execution of models with high technical and aesthetic quality, which earned him significant commercial success. In 1979, the Italian glass maestro came to the United States to teach at Pilchuck School in the Seattle, thus beginning a long history of sharing his centuries old technical knowledge with American glass artists. The glass artists of the then burgeoning American studio glass movement were hungry for Lino's technical knowledge and Lino, in turn, was greatly effected by the artistic freedom and experimentalism he observed in his American counterparts. In the 1980's Lino was best known for the collaborative work he did with several American artists, including Dale Chihuly and Dan Dailey. But in the 1990's, although he continued to teach and collaborate widely in the U.S., Tagliapietra began to be widely recognized for his own unique works of art. Since 1990 Lino has become a free practicing artist of glass without any contractual binds or obligations, and he is now fully dedicated to creating his unique pieces that are present in some of the most prestigious museums throughout the world, including Carnegie Museum of Art in Pittsburgh, the De Young Museum of San Francisco, the Metropolitan Museum of New York, The Renwick Gallery in Washington, D.C. and the Victoria and Albert Museum of London, as well as numerous galleries and private collections. 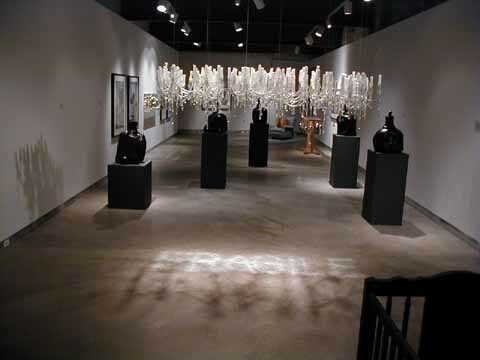 Twelve artists stepped out of their comfort zone and into the glass studio for the 2014 Pittsburgh Biennial at Pittsburgh Glass Center, a part of the largest survey of regional contemporary art. and encourage exploration in other art forms. The PGC program was created in 2012 to bridge the gap between glass and other art and design media. The goal is to educate artists about glass, give them access to the material and help them advance their ideas in a new media. Over the course of the program, PGC realized that the synergy between the glass artists and the artists unfamiliar with glass held more than just creative potential. The process of collaboration and exchange became just as important as the outcome. For this reason, PGC made Idea Furnace a six-month residency for glass and non-glass artists and in anticipation of the Biennial, PGC selected the twelve participating artists based on their creative reputation. “We hand-selected the artists to represent a wide variety of stages in their careers, material and type of work. We looked for artists who did not traditionally work in glass, were doing interesting work in Pittsburgh, whose work we admired and would translate interestingly into glass. They were all drawn to the new material with a fresh perspective, no rules and unlimited possibilities. 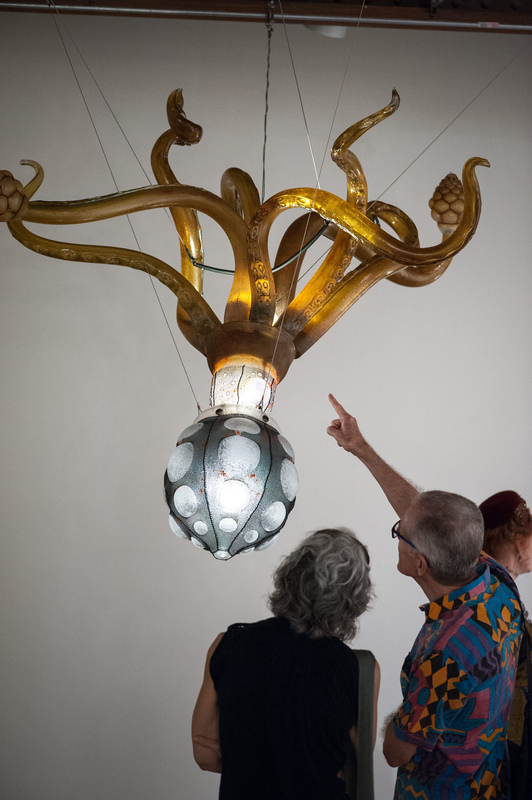 It was an eye-opener for our glass artists and challenged them to think differently about the material,” said Heather McElwee, PGC Executive Director and curator of the Biennial at Pittsburgh Glass Center. Well-known glass artist Therman Statom, based in Omaha, NE, returned to Pittsburgh in the summer of 2015 for another residency at Pittsburgh Glass Center. 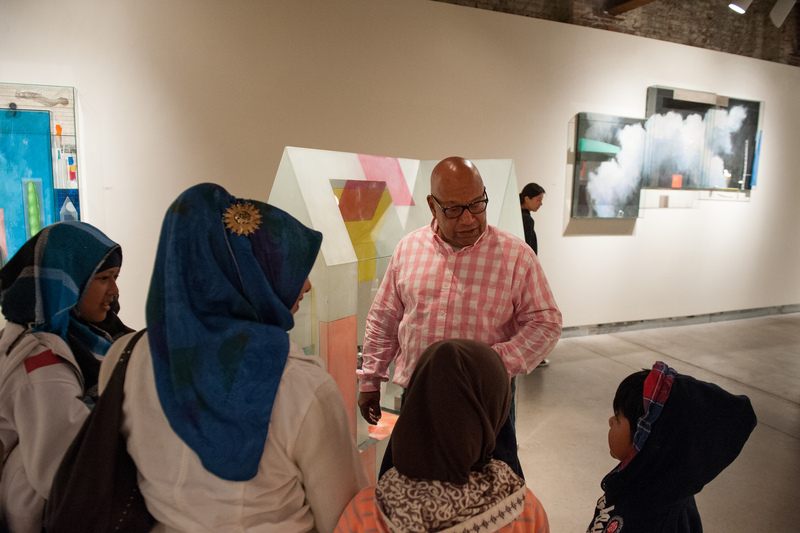 In addition to creating new work for this exhibition, he worked with community leaders, artists and children including Brothers and Sisters Emerging (B.A.S.E.) and S Group Consulting to create a mural along Penn Avenue. Over 100 residents came together to engage in conversations and creation around community history, diversity and common hopes and goals for the neighborhood. More than 50 neighborhood children learned about the creative process and participated in hands-on glass workshops with Therman Statom. 11 Pittsburgh artists contributed panels for the mural including: Bill Satterwhite, Charlotte Ka, Errol "Mobutu" Reynolds, D.S. Kinsel, Boris Balsindes Urquiola, E. Ali Reynolds, Kai Devenitch, Takara Canty, Christine Bethea, Darnell Chambers and Naomi Chambers. Statom’s colorful community mural inspired by the vibrant Garfield community was unveiled in September 2016. 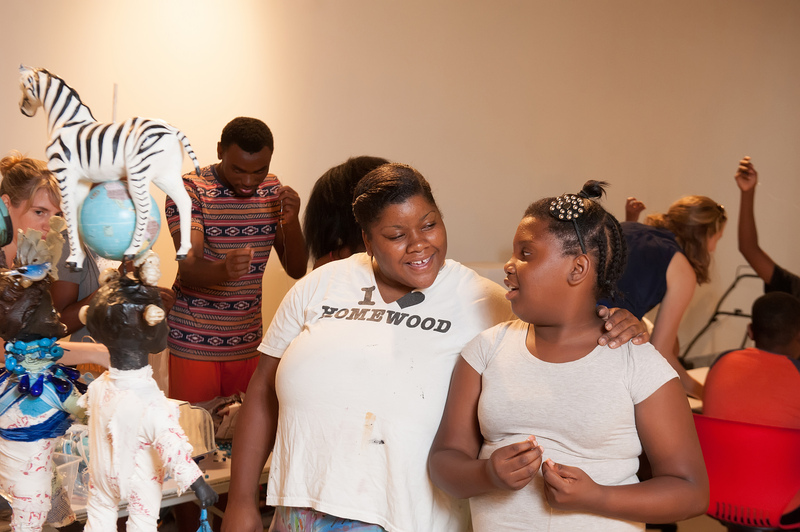 The mural was supported by Justin Cipriani, Julie Henderson, Cynthia Warden, The Benter Foundation, Laurel Foundation, and Advancing Black Arts in Pittsburgh, a partnership of The Pittsburgh Foundation and The Heinz Endowments. Statom was previously in Pittsburgh for a residency in 2007 during Pittsburgh’s city-wide Year of Glass celebration. During that time, he held workshops with local children. Together they constructed a large glass house in the lobby of the Fifth Avenue Place building downtown Pittsburgh.